This report contains both summary and detailed data about the health of devices in your ConfigMgr environment. It is a Microsoft Excel report that uses SQL data connections to your ConfigMgr database. Minimum software requirements are Microsoft Excel 2010 and System Center Configuration Manager 2012. Monitoring and maintaining the health of your clients is an important task for any ConfigMgr administrator. This report aims to gather important data about the health of your clients, with an ‘at-a-glance’ summary sheet, charts that represent key data graphically, and several data-table worksheets that contain the full list of clients in your environment in their different health states. Much of the data in the report can be found in various places in the ConfigMgr console, or in the SSRS reports, but this report brings all this data into one place for simplicity and convenience. On the Summary worksheet, you will find some key data relevant to client health. First, we have the total number of ConfigMgr clients in your site database. We have a count of the number of clients in their various health states. The health states indicate whether a client is active or inactive, and whether the client has passed the client evaluation check. 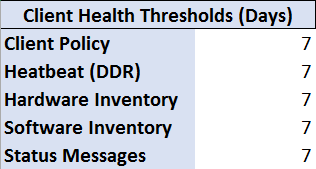 A client is marked as active if it reports activity within the thresholds defined in your Client Status Settings, for any of the defined settings, including Client Policy request, Heartbeat discovery (DDR), Hardware inventory, Software inventory and Status messages. If the client has reported no activity within the thresholds in any of the settings, then it is marked as inactive. The Client Status setting thresholds are defined in the ConfigMgr Console, under Monitoring > Client Status > Client Status Settings (in the ribbon). The client health evaluation is a scheduled task that runs on each ConfigMgr client and starts the program “ccmeval.exe”, which performs various checks on the health of the ConfigMgr client and the things that support it, such as WMI and BITS etc. If all the checks pass, then the client is considered healthy. If any check fails, remediation may be attempted (this can be disabled if required). If remediation fails, the client is considered unhealthy. In the event that there are no results returned for the client health evaluation, it will have the status “Unknown”. 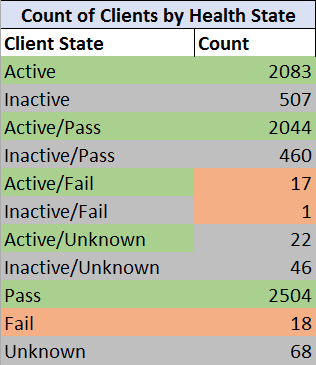 Ideally, all your ConfigMgr clients should be in the Active/Pass state, although stale computer accounts in Active Directory, stale records in the ConfigMgr database, extended employee absence, and other factors can all affect the count. Any machine in the ‘Active/Fail‘ state should be investigated, as should any machine in the ‘Active/Unknown‘ state. Here we have some basic info for your ConfigMgr site, which comes from the v_Site database view. The base version does not represent the current CU level. These are the thresholds (in days) that have been configured in the Client Status settings for your site. If any client has not reported activity for a particular setting within the threshold defined, it is considered inactive for that setting. The client itself will still be considered active if it has reported activity within the threshold for any of the other settings. This is a count of all clients that are reporting either active or inactive for each of the Client Status settings (except status messages). This is a count of clients by the ConfigMgr client version installed. It will report up to 6 different versions in the summary. This is a count of the number of discovered systems that have a record in the ConfigMgr database, but do not have the ConfigMgr client installed. Ensuring that computers are regularly restarted is an important part of maintaining client health, especially when ConfigMgr is used for software installations and software update installations, as in many cases a machine will not report compliant until it has been restarted. Here we list the number of machines that have not been restarted in the time period specified. Finally, we have a listing of all the charts and data tables in the report, referencing the description with the name on the corresponding worksheet tab. 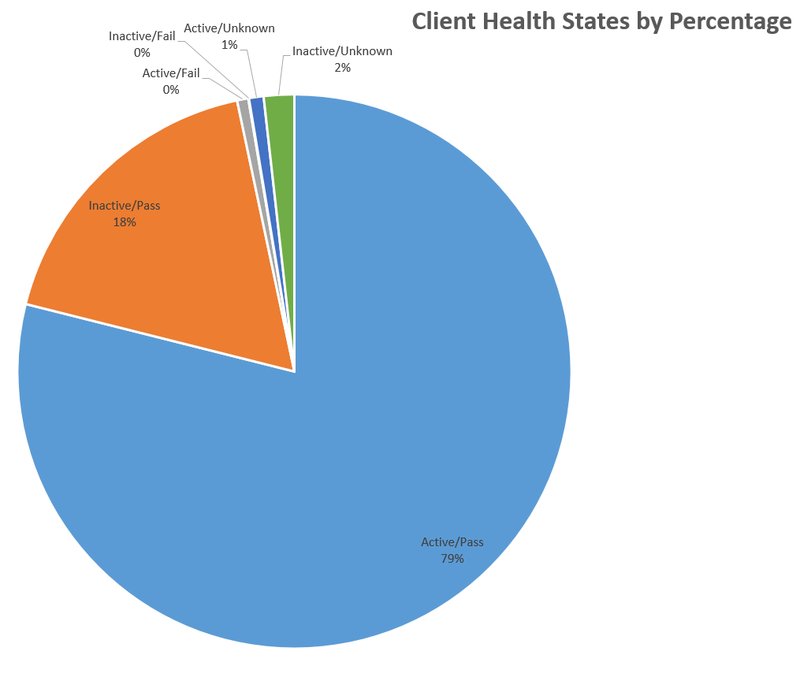 This chart displays clients by percentage in their various health states. In a healthy environment, the Active/Pass state should be the vast majority! 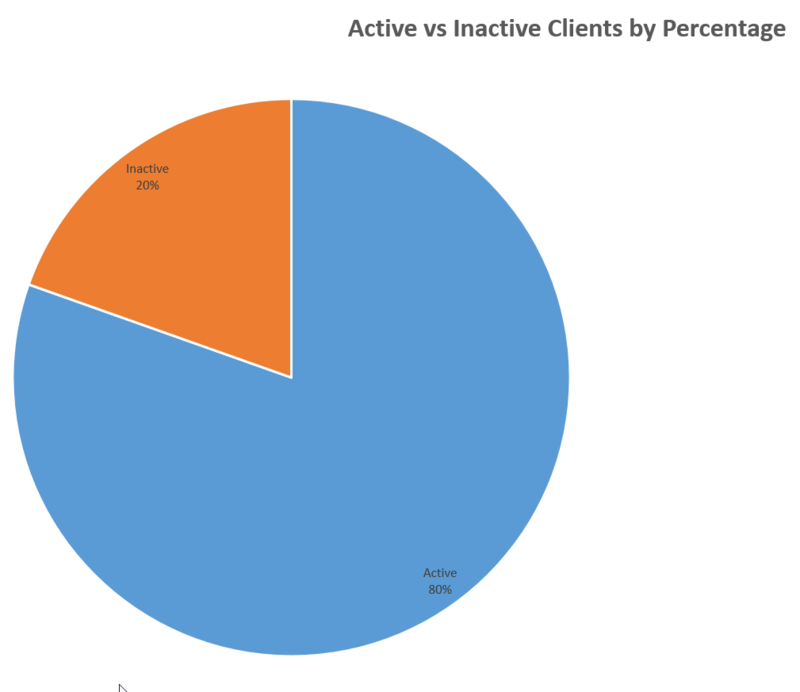 This chart displays the active and inactive clients as a percentage of the overall client count. 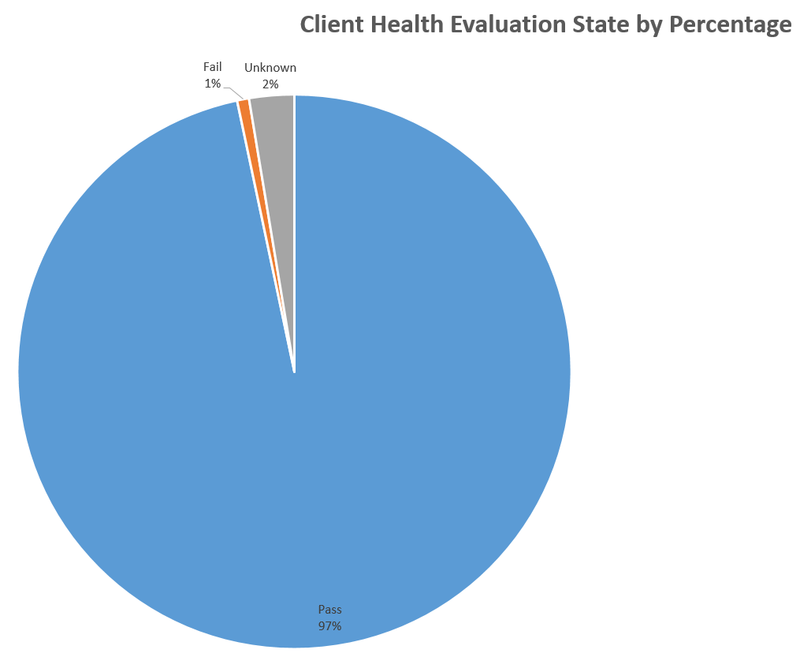 This chart displays clients in their health evaluation state, as a percentage of the overall client count. 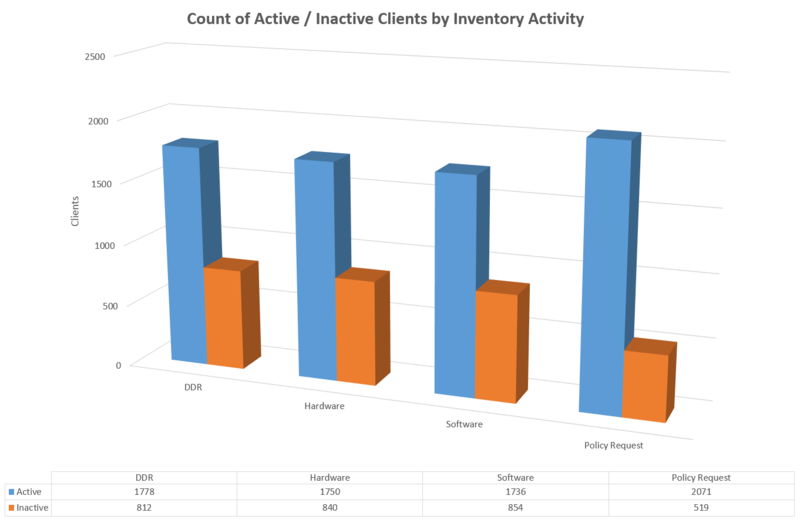 This charts displays the count of clients that are either active or inactive, according to the thresholds you have set, for each of the different client status settings. Using Excel’s filtering capability, we can filter for clients in specific states or that reported results in specific time periods etc. All clients in an Inactive state, sorted by the last active time. All clients that have exceeded the threshold set for DDR (heartbeat discovery), sorted by the last DDR date. 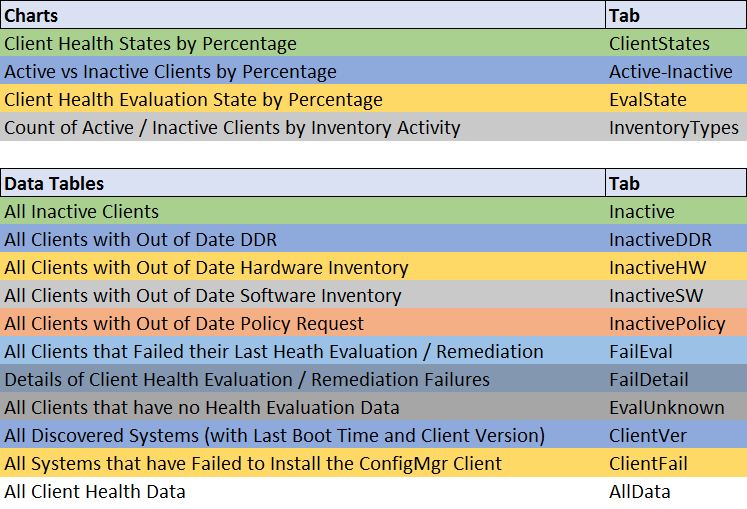 This table lists all clients that are in the “fail” state for client health evaluation. These clients did not successfully complete the health evaluation or remediation, and should be investigated. The table contains the same fields as the previous tables. This table contains the same list of clients as the previous table, but gives the details of which evaluation check or remediation task failed, together with any error code or error description reported, which is helpful for quick troubleshooting. Lists all clients in the “Unknown” state that have not reported any health evaluation data. This could represent machines that have not yet run the client evaluation task, or where the task has not been installed correctly, or is not functioning correctly, for example. At least the active and online machines should be investigated. 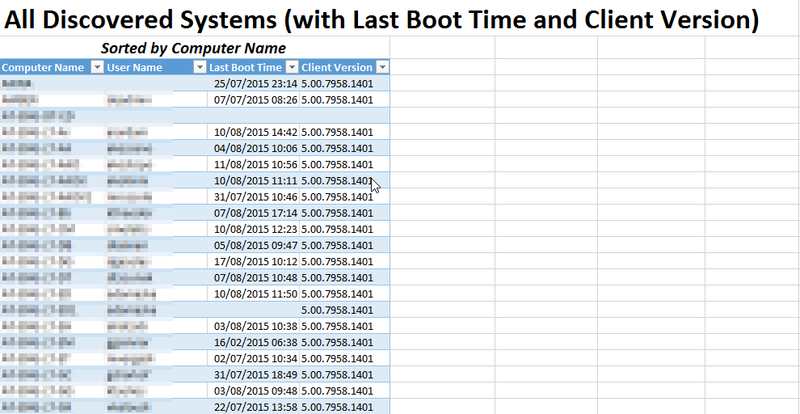 This table will enable you to find the last boot time of any client, from the current hardware inventory data in the database, or filter for a list of machines that haven’t rebooted in a given time period. You can filter for any client that is not at the current CU level for your environment. You can also filter for blanks in the Client Version column to identify systems that have been discovered and have records in the database, but do not have the ConfigMgr client installed. This table lists all machines where ConfigMgr has tried to install the client, but has not been able to do so successfully. You can see, for example, the number of attempts ConfigMgr has had at trying to install the client (using client push installation), when was the most recent attempt, and what is it’s current status. You can also see the error code. To translate the error code to it’s more friendly error description, you can use the script I published here. Or, if you want to include the error descriptions in the report as you can see in the screenshot, you can create a database of error codes and descriptions, and link to it in the SQL query. To do that, follow the instructions here to create the database, then change the “Client Install Failures” data connection in the report to use the SQL query below. This will join the error codes to their descriptions, and add them to the report. Once you have the error codes translated, you can better understand why the installations are failing. For example, error code 67 translates to “The network name cannot be found”, which usually indicates the machine is offline, or the host name could not be resolved to an IP address. Sometimes you may see a machine that has the status “Complete” and the error code 0, which indicates success, but if the machine is in this list, then it either does not have the ConfigMgr client installed, or it has failed to register with the management point, and should be investigated. Finally, this table contains all ConfigMgr clients whatever their health status, and can be used to filter for machines according to your own custom filtering requirements. For example, if you want to quickly find the client health status of a particular machine, simply filter for it in the Computer Name column. Hello, I would like to incorporate a modified version of one of your SQL queries contained within this spreadsheet into a Powershell script I wrote designed to check client health versus active accounts in AD. Is it okay if I republish that query? I will be sure to credit you with a link back. First of all thank you for sharing a fantastic report. Saves a lot of our time . Just one question – Is there any way we can narrow down our search based on collection instead of Entire Database ? Currently its searching Entire database and I am getting 100’s of entries which I don’t need . It would be really helpful if you can bring it down to collection instead of entire database.